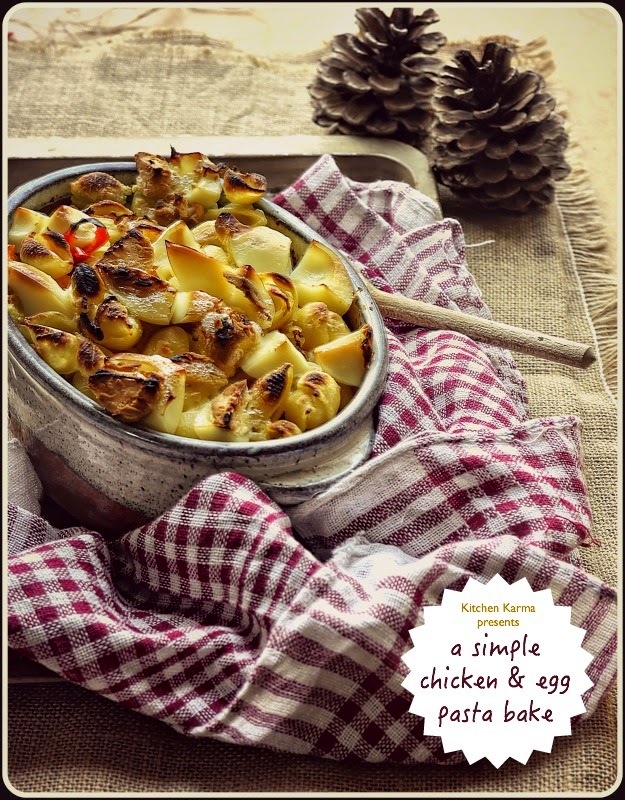 Kitchen Karma: A simple chicken & egg pasta bake with Comté Cheese! Warning: If you are on a diet, any kind of diet, this post is strictly not for you. Please stay away, because reading this post may lead to a bad dose of pasta craving and your diet may will go for a toss. Stay away. Don't read. I still remember the taste. It was predominantly warm salty butter and gooey melted cheese. Together they tasted sublime. A dash of pepper added a hint of heat. The two, cheese and butter coated nicely and settled snugly within the concave shapes of crisply baked pasta shells, some hard boiled eggs and shredded boiled chicken and created a taste explosion in my young mouth. I remember chewing it all slowly, very very slowly and wondering to myself how could it taste so nice. And the smell, ah that buttery cheesy smell. If I close my eyes I can still catch a whiff of that smell from those long left behind days of my childhood. I was probably 6 or 7 years old. Yes my love affair with food started early. And my introduction to baked pasta went very smoothly indeed. An aunt made it and called us all for a meal. It was a crowded family meal, like all our family meals are. But I don't remember anything else about the occasion except the food. I grew up begging her for repeats. 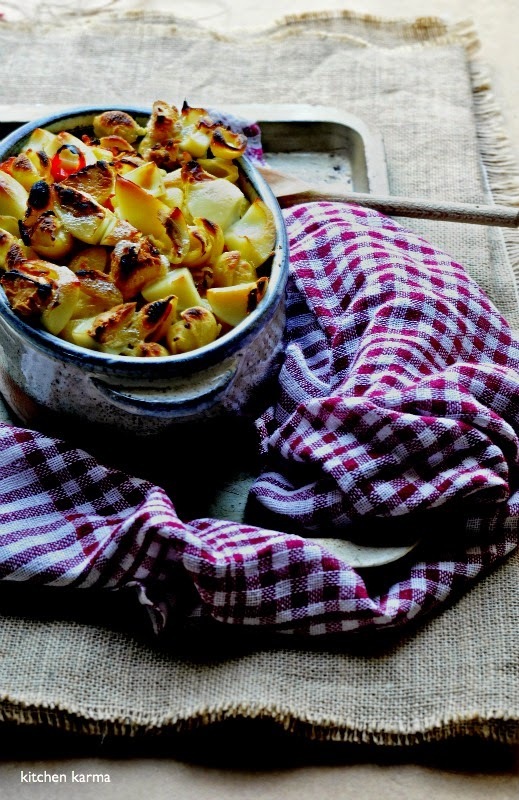 Once I left home, I started fiddling with pasta bakes to recreate that childhood magic. Needless to say I have eaten my way through many a baked pasta dish, searching for that elusive taste. At this point you may wonder why I didn't ask her for the recipe. I asked, several times, and she promised me too, but somehow that recipe never made it's way to me. At one point I was pretty sad about it, but now when I look back I know everything happens for a reason. Because otherwise I wouldn't have had the satisfaction of figuring it out on my own. Karma, you know! Over many trials I tried various forms, complicated it endlessly, added and subtracted n number of ingredients, made sauces, crushed peppers, grated cheese, flavoured it with herbs, both fresh and dried..the list goes on and on. Yet always felt disappointed when I tasted the dish. It never matched what my taste buds were craving for. After one forkful I would push it away disappointed, while husband would praise the pasta to the skies and wolf it down. What I couldn't explain to him was that this pasta that I had cooked may be good, but it was not the pasta I was looking for. He would nod his head, and then point out, maybe that was the case, but this pasta was still good, and that I should finish my dinner. I would eventually, but my brain would be whirring away trying to recreate that taste I was after. If you are wondering if I had been holed up in my kitchen experimenting with pasta bake, no I was not. I was just taking an unofficial break from the blog, enjoying summer, travelling (more on that later) and being lazy. But sooner or later your blog catches up with you and you are back talking about the food you love. The recipe did eventually come to me. And when it did it left me breathless. It was simple. Yes simple. No sauces, no fancy anything. It has a couple of ingredients, basic flavouring agents and that is it. It has butter, it has cheese, it has eggs and it has chicken. And that was it. I knew I had to make it the very next day and I did. Now that I have nailed it, I keep making this recipe once in a while. But I can't tell you the deep satisfaction that I feel knowing that I know the recipe and can make it anytime I want to. That's priceless! 6. Any vegetable you want to use, my aunt used to give cubed green pepper, I use carrots, fat red chillies, sweet corn, whatever my fridge yields. Slice them to similar size as the onion so that it all cooks at the same time. 7. 100 grams of any good cheese cut into small cubes. In this instance I used Comté cheese which the good people at Comté had sent me over to taste. 1. Preheat your oven to 150 degree C.
2. Boil the pasta according to instructions on the back of the packet. Unlike other pasta recipes, in this recipe you need to wash the pasta once it is boiled and drain it. 3. Heat a large frying, turn the heat to medium low (because butter burns rather quickly and then it's not nice at all), add the butter, minced garlic and cubed onion and fry for a couple of minutes till the onion slices turn translucent. 4. Add the shredded chicken and whatever vegetables you are adding. Fry for a couple of minutes more. Season well. 5. Then add the drained pasta. Turn off the heat. Toss the pasta so that it gets evenly coated with the butter. 6. Add the cubed pieces of boiled egg and cheese. 7. Spread this in a oven proof dish and put it in the oven for about 20 minutes to half an hour. The last 5 minutes or so you could grill the top to make the pasta shells crispy and brown. 8. Serve immediately. By now it would smell heavenly, but hold on those steams coming out of the pasta is for real and can cause grave injury to your tongue and mouth. Ask me, been there, got burned. So once the pasta cools down sufficiently, have it. I guarantee utmost satisfaction. By now you must have realised that it is indeed a very simple recipe. You do not need to be a trained chef to be able to make it. Mostly you can make do with your pantry and fridge ingredients, and it is pretty quick to make as pasta bakes go. Now about the cheese that goes into the bake. I have tried it with loads of cheese, processed, natural, fancy, expensive, cheap, value. And I have realised that this recipe begs for a good cheese. A cheese with lots of flavour of it's own and which adds it's own depth to the dish. Since there are not many flavours fighting for attention in the dish, the cheese gets the space to melt slowly in the hot oven and create it's own flavour heaven. This is where Comté cheese comes in. 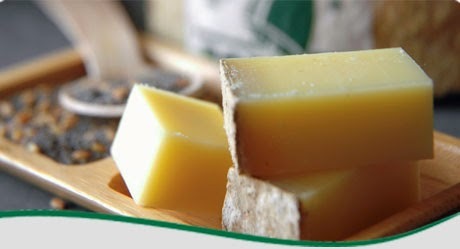 This image has been taken from Comté Cheese's website. According to BBC Food Comté is a hard, fruity mountain cheese not dissimilar in character to Gruyère; in fact, it sometimes goes under the name of Comté Gruyère in its homeland. Made with cows’ milk in the Franche-Comté region of eastern France, it has a pale yellow interior, silky texture and nutty, sweet flavour, and is one of the country’s most popular cheeses. Comté cheese is usually eaten on it's own, maybe with a glass of wine and I love doing just that. But when I have a couple of samples to work with, I just can't resist the urge to use them in my cooking. And I am so glad I did. I used an eighteen month mature cheese and oh boy I felt I should have used 200 grams of cheese. But then that is just me being super cheese greedy. If you enjoyed this post and recipe, check out my mac and cheese recipe using Comté Cheese. I was not compensated monetarily for this post. All opinions expressed are my own. Never tried this cheese but sounds good...will surely try! Hi, Suchi. 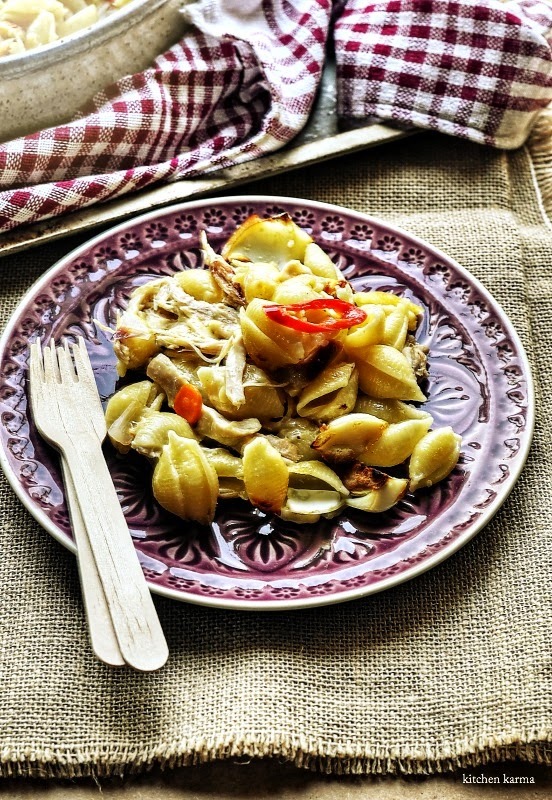 This pasta bake sounds delicious; looking forward to read about your trip to Istanbul!